Vampire Pez fangs you, fangs you very much. Pezhead Monthly: Thanks for joining us, Vampire Pez. You're not the first Halloween dispenser to be interviewed by this publication, and I strongly suspect that you won't be the last. But you do have the fortune of being the only new dispenser in the Halloween set this year. How does it feel to join the always growing family of Halloween dispensers, and of Pez in general? Vampire Pez: Well, I consider myself a pretty modest fellow, but I gotta say... it's about time! Don't get me wrong, the many different variations of skulls, witches, pumpkins, and ghosts over the years have been quite remarkable, and I know they hold a special place in many a Pezhead's collection. And in recent years they've also added unique characters like the black cat and the bat. I've personally met many of them and they're great. But I think a little vampire love is long overdue in the Pez world. I was beginning to think I would be "count"ed out. PM: Ah! I see what you did there. Very nice. Do you have any thoughts on the timing of your release? VP: I think I know what you're getting at, and yes, it seems that there's a bit of a vampire craze going on now. The kids are all crazy about that True Blood show on cable, plus there's all the Twilight books and movies. So really, it makes sense that Pez would jump on the vampire train. And hey, I'm not complaining! I'm here, aren't I? And I'm having such a great time. Regrettably, unlike Edward Cullen, I don't sparkle or brood all that well, and truth be told, I'm more of a Team Jacob dude anyway. But I do glow in the dark, so I got that going for me, which is nice. PM: You've also got a pretty unique design going for you, Vampire Pez. The red and purple cape is particularly stylish, and the skull on your bow tie is a nice touch. Do you find yourself giving fashion advice to your fellow Pez dispensers? VP: You're much too kind! But no, I'd never think to do that. Who am I, Tim Gunn over here? And let's be clear, there were plenty of other stylish vampires before me. Gary Oldman in the Dracula movie comes to mind, and of course there was Tom Cruise and Brad Pitt in the movie "Interview with a Vampire." Hold on a sec... this is also an interview with a vampire... that's pretty trippy, man! PM: Indeed it is. Also on the topic of your appearance, has anyone ever told you that you bear an uncanny resemblance to the hilarious comedian Patton Oswalt? 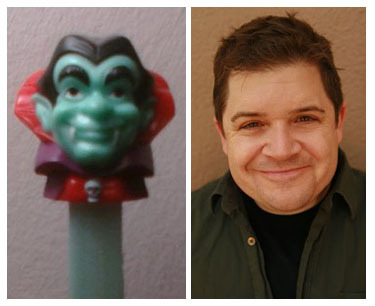 Vampire Pez and Patton Oswalt: Separated at birth? VP: Well, in the short time I've been a Pez dispenser, I've already been compared to Emeril Lagasse, Supreme Court Justice Antonin Scalia, and Captain Mauser from the Police Academy movies. I haven't gotten Patton yet, but now that you mention it, I do see a resemblance there. He's quite the funny chap, so I'll definitely take it as a compliment! PM: And you certainly should, Vampire Pez. Finally, what do you think it is that makes Halloween and Pez such a good match? VP: When you think about it, it's a natural fit. On Halloween, people open their doors to visiting children and pass out candy. Much like Pez dispensers, which tilt back their heads to dispense candy to kids of all ages. And really, what better way to say "I really dig that Buzz Lightyear costume, little man" than to give out a Pez dispenser? Perhaps even a Buzz Lightyear Pez dispenser? I am looking forward to being a part of this awesome holiday for the first time. Just remember to fill me with Pez candy and not garlic. I'm just sayin'.